A commercial building could be a valuable, untapped asset for collecting solar energy! Put your rooftop to work and boost the value of your business by reducing its operating costs with a commercial solar installation. Commercial solar systems are capable of generating small to large portions of your electricity usage, depending on available rooftop space or land area. These systems qualify for a 30% Federal tax credit and accelerated depreciation—not to mention a long-term, reliable, on-site power generation asset. There are many creative ways to make your commercial solar installation a reality. See below to explore popular installation options and further information on commercial solar power topics. Commercial building roof design can range from angled shingle or metal roofs to expansive flat roofs on larger facilities. Many commercial solar installation and mounting options exist and Tick Tock can help you decide on what works right for you. To see a recent commercial roof-mounted solar panel installation, click here! 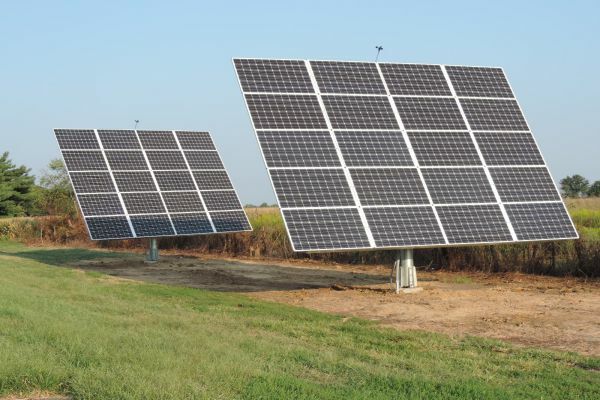 For commercial properties with available land, installing a large ground mount system or building a field of AllEarth solar trackers may be the perfect option for you. Our experts can help you make the right choice. Additionally, a visible solar project could be an important element to your company’s image and commitment to sustainability. To see a recent commercial ground-mounted solar panels and dual-axis solar tracker installation, click here! Often an under-utilized asset is a business’s parking lot area. Solar carports can convert your parking lot to a power plant! Also, your employees and visitors will appreciate convenient shade or shelter from the bright sun, rain, snow or ice! To see a recent commercial solar carport installation, click here! The support racks for commercial solar installations vary based on the connection point between the rack and the roof surface. In the Midwest, common roof types are metal and shingle. Metal roofs are typically panel type or standing seam.